WATERCOLOR is the pick of a flush of black polled fullblood heifer calves out of MacDonald Ranches fullblood ET donor dam, MAC BLK MADISON 306M. WATERCOLOR is a high-capacity, long-sided and square-made female who has been DNA tested to be homozygous black. Her dam, MADISON, is an ASA Silver Dam and is also the mother of MAC F1 SAMURAI 70S, a bull who has seen natural service in the MacDonald Ranches program for the past three years. 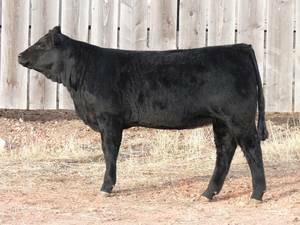 Another son, MAC F1 MADISON 3P, is a herdsire for Parke Ranch of Drummond, MT. WATERCOLOR has been DNA tested to be homozygous black. This is a female who offers foundation genetics for any black polled fullblood Salers breeding program.